The rock crystal is carved in the form of a recumbent ram with its head turned to the right and legs tucked beneath its body. One small ram lies recumbent above the mother figure while another small ram hides behind its haunch. 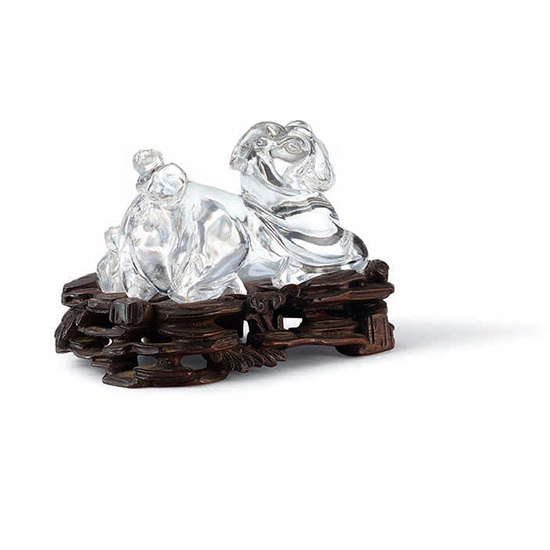 The rock crystal is polished to a high finish and rests on a wooden stand with rockwork and foliage design. A related jade example is published in The Complete Collection of Treasures of the Palace Museum: Small Refined Articles of the Study 故宮博物院藏文物珍品大系： 文玩, 2009, p. 118, Catalogue No. 86.